Presenting you a exclusive hand picked list of boy and girl names suitable for babies born in Dhanu Rashi (23-Nov to 21-Dec). These names are modern and trendy. Traditionally Indian parents give name to newborn based on Rashi (Moon sign) as per Hindu Astrology. The rationale behind naming kids based on rashi is that every rashi has associated syllables called beeja aksharas. Choosing baby name starting with these syllables will benefit kids. It is believed that sound of the name will give positive vibes. Also it is auspicious and beneficial if name is beginning with the letter associated with his/her rashi. Child's rashi will be determined by the sign in which the moon is placed at the time of her/his birth. If your baby is born between 23-Nov and 21-Dec then look no further, we've hand picked latest 100 Dhanu Rashi names. 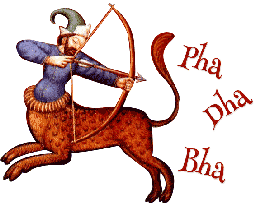 Dhanu rashi (धनुष Dhanuṣa) is the ninth sign of Zodiac. Corresponding Zodiac sign (Sun Sign) for Dhanu Rashi is Sagittarius. It is represented with centaur with bow-arrow. "As per Vedic Astrology, the first letters associated with Dhanu rashi are bha ('भ' ), dha ('ध') and pha ('फ')." Choosing a modern name for a baby boy is becoming popular. Traditional names are long and sometimes hard to pronounce. Moving with the times is absolutely imperative. Nobody has taste for things that belong to a bygone era and find little relevance in the modern times we live in. It is true for names too. So we present you this exclusive list of boys’ and girls’ names suitable for babies born in Dhanu Rashi. These names are modern and in trend. Take a look at this Latest 100 Dhanu Rashi Names for Boys & Girls. For more detailed information on Names by Rashi, check out this page. भ से शुरू होनेवाले धनु राशिके लड़कों के नाम. Dhanu rashi names for baby boy starting with letter Bha ('भ'). भ से शुरू होनेवाले धनु राशिके लड़कियों के नाम. Dhanu rashi names for baby boy starting with letter Bha ('भ'). ध से शुरू होनेवाले धनु राशिके लड़कों के नाम. Dhanu rashi names for baby boy starting with letter dha ('ध'). फ से शुरू होनेवाले धनु राशिके लड़कों के नाम. Dhanu rashi names for baby boy starting with letter pha ('फ').